Oven-baked, easy to make and the perfect game day food for all to enjoy! 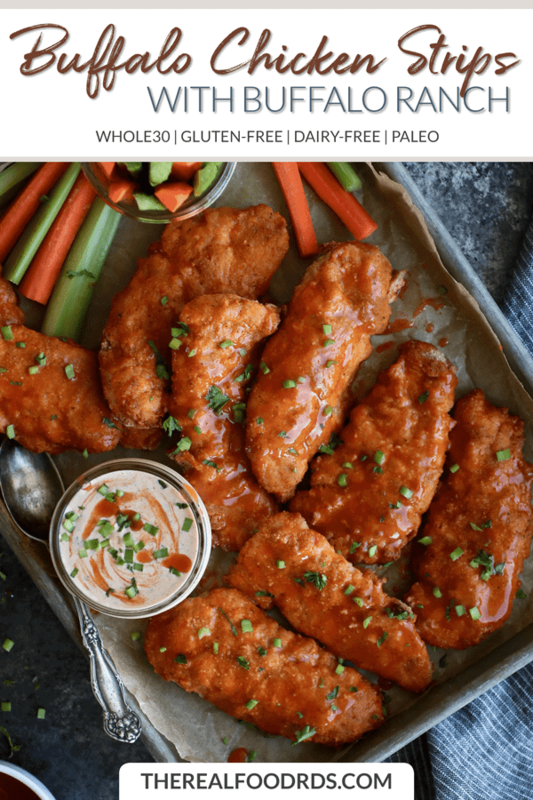 These Buffalo Chicken Strips with Buffalo Ranch Dip are a healthy, Whole30-friendly and delicious alternative to the popular boneless buffalo wings. Game day food at its finest. Whether you’re a football fan or not, there’s something quite cozy and enjoyable about staying in on a Sunday and tuning into a football game. Maybe it’s the tasty appetizers, maybe it’s because you’re a true fan (or your state’s team is doing good so why not jump on the bandwagon? #guilty) or maybe it’s because it’s the perfect excuse to chill out and be lazy for a change. 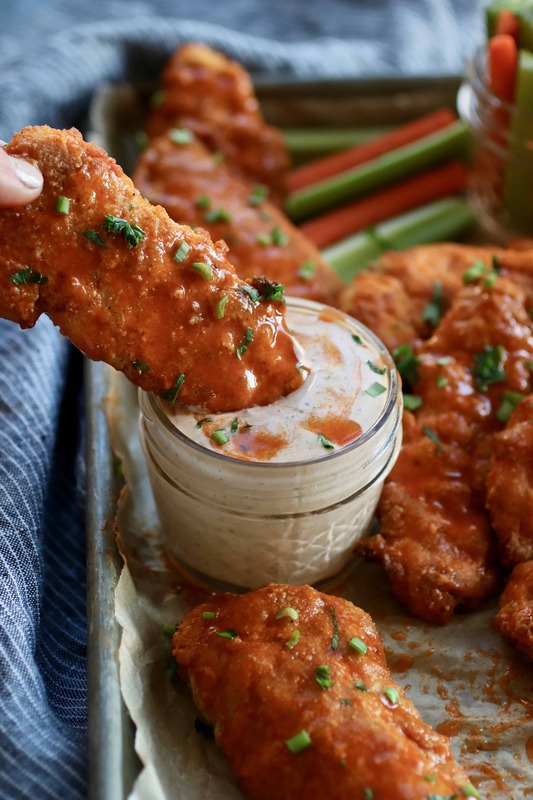 Whatever category you fall into, these Buffalo Chicken Strips with Buffalo Ranch Dip will make a great addition to your football Sunday menu. Also, perfect for holiday gatherings and parties. OK, so maybe you’re not a football fan AT ALL. That’s totally fine. 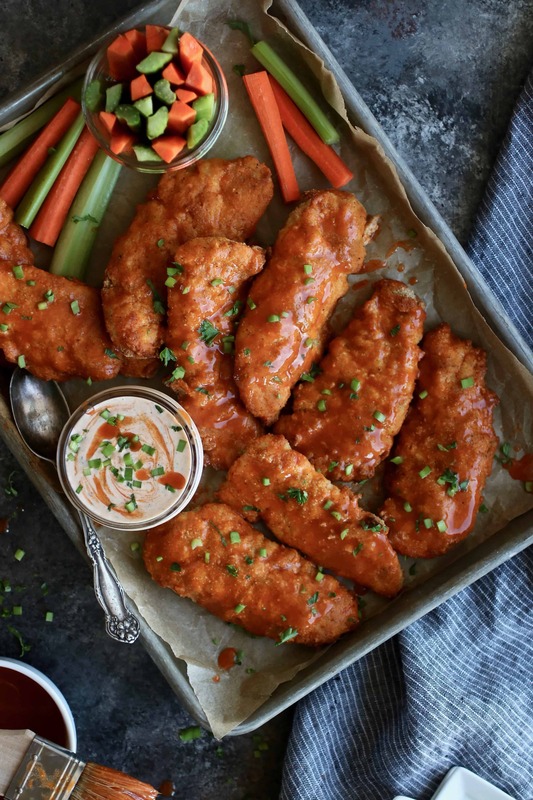 These Buffalo Chicken Strips with Buffalo Ranch Dip are also perfect for serving at upcoming holiday gatherings and parties…or game nights or date nights – the list goes on. In my family, anything buffalo is a winner! 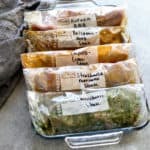 AND now that I think of it, some of the most popular recipes on this blog are buffalo flavored. 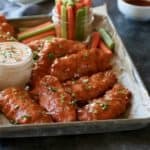 Slow Cooker Buffalo Chicken, Cauliflower Buffalo Bites and Crispy Baked Buffalo Wings to name a few. So there’s a good chance, you’re a buffalo fan, too! 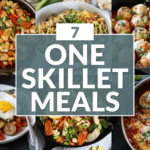 Serve ’em up for an easy weeknight dinner, too! 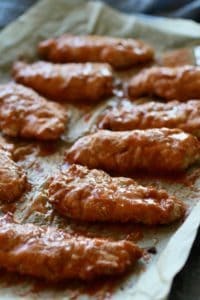 Buffalo Chicken Strips with Buffalo Ranch Dip also make for a hell of a dinner if ya ask my husband! 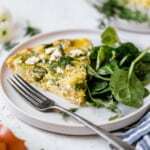 He’s been my taste tester with this recipe so he’s enjoyed them a number of times for dinner during the past couple of weeks. Like every night this past week! 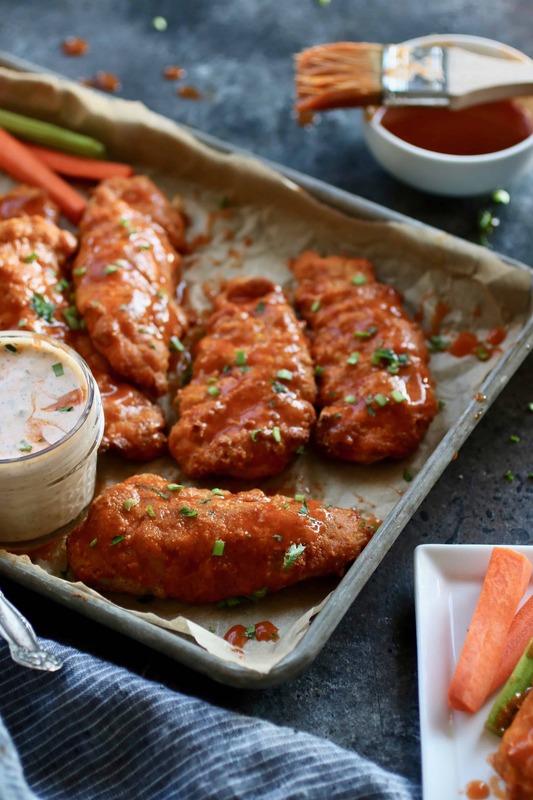 He has some pretty high standards when it comes to buffalo chicken – his favorite food. 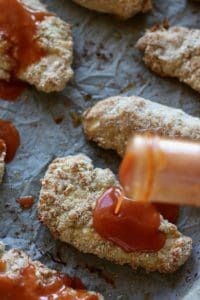 To make these Buffalo Chicken Strips super kid-friendly, you could omit the cayenne, leave them naked and serve them with ketchup or ranch for dipping. 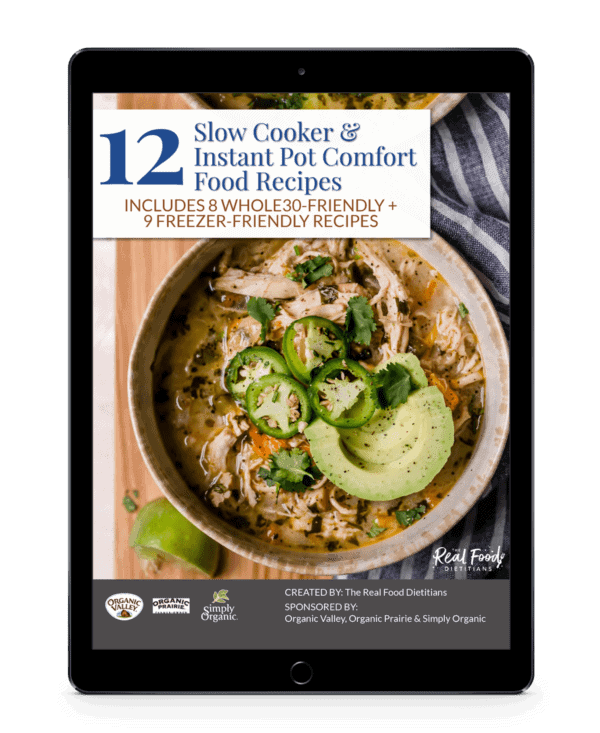 I recommend serving them with your family’s favorite veggie to make for an easy and well-balanced weeknight dinner that takes less than 3o minutes to make. 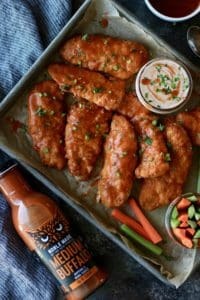 Made with The New Primal Buffalo sauce. 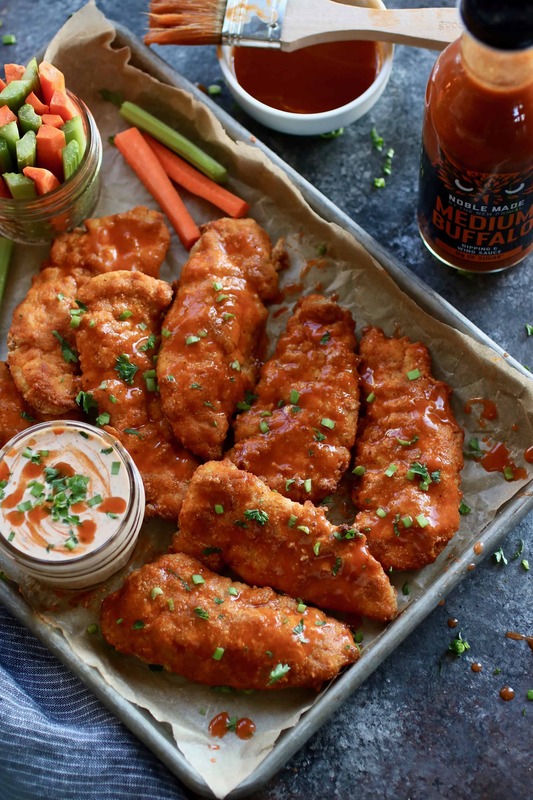 What makes these Buffalo Chicken Strips so darn delicious is not only the homemade seasoned breading, but also The New Primal Buffalo Sauce. It’s all about the sauce! 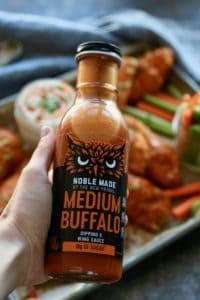 The New Primal Buffalo Sauce is Whole30-friendly, made with only real food ingredients, has the perfect consistency/viscosity and comes in three levels of heat – Mild (also available on Amazon), Medium and Hot. 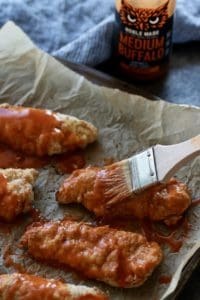 Buffalo Chicken Strips are gently tossed in the sauce after baking and the sauce is also added to our homemade ranch to make for the most delicious dip. Don’t forget the Buffalo Ranch Dip! The Buffalo Ranch Dip that I’ve included in the recipe, is totally worth the 5 minutes it takes to make it. 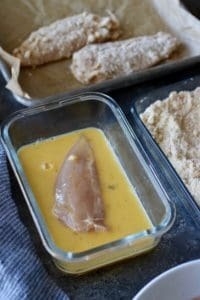 Chicken strips are simply not complete without something to dip them in. And that’s exactly why I whipped up this Buffalo Ranch Dip using our Homemade Ranch. For ease and convenience, you could also use a bottled ranch of your choosing. 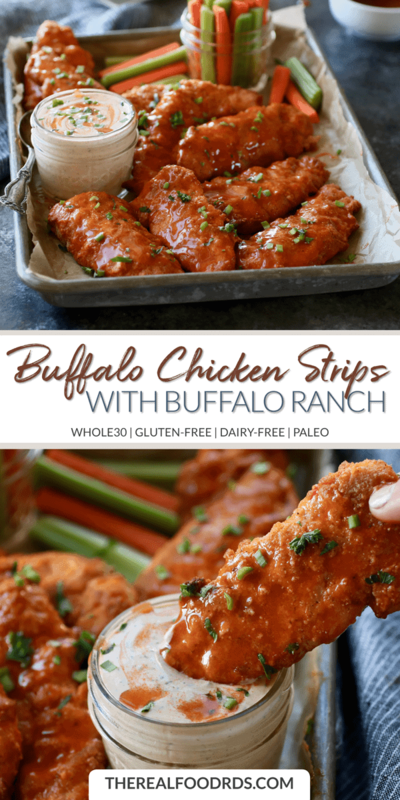 Not only is this Buffalo Ranch Dip the perfect accompaniment to the Buffalo Chicken Strips, but it’s also tasty as a salad dressing, for dipping roasted or raw veggies, and for making chicken or egg salad. The options really are endless for all of you Buffalo lovers. Oven-baked, easy to make and the perfect game day food for all to enjoy! 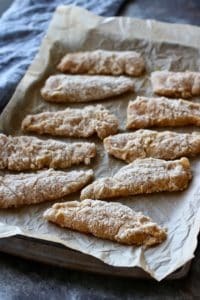 These Buffalo Chicken Strips with Buffalo Ranch Dip are a healthy, Whole30-friendly and delicious alternative to the popular boneless buffalo wings. 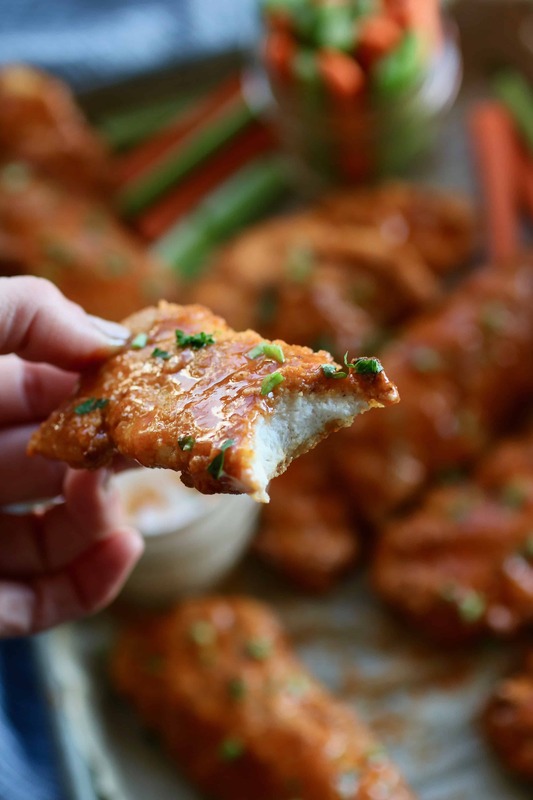 Note: Pan-fry for extra crispy Buffalo Chicken Strips. See instructions below. Line a baking sheet with parchment paper. Spray parchment with olive oil cooking spray. While chicken strips are in the oven, make the Buffalo Ranch Dip by mixing 3/4 cup of ranch with 2 Tbsp. 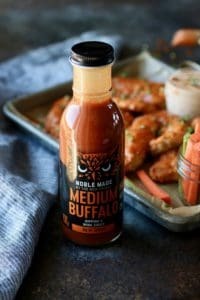 Buffalo Sauce. Place in fridge until ready to serve. 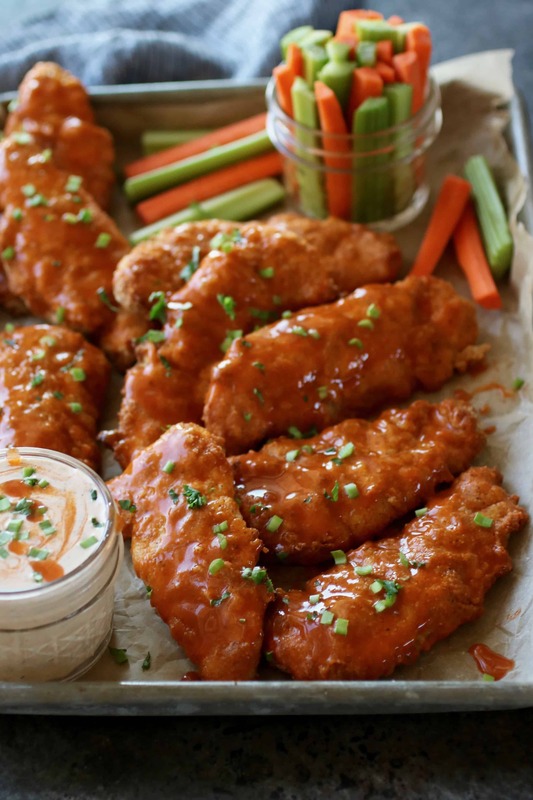 Place on a serving dish and serve with Buffalo Ranch Dip, carrots, and celery. What if I wanted to make 8 servings? 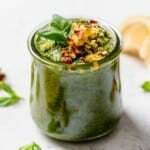 Should I multiply the ingredients by 1.5? These look amazing! 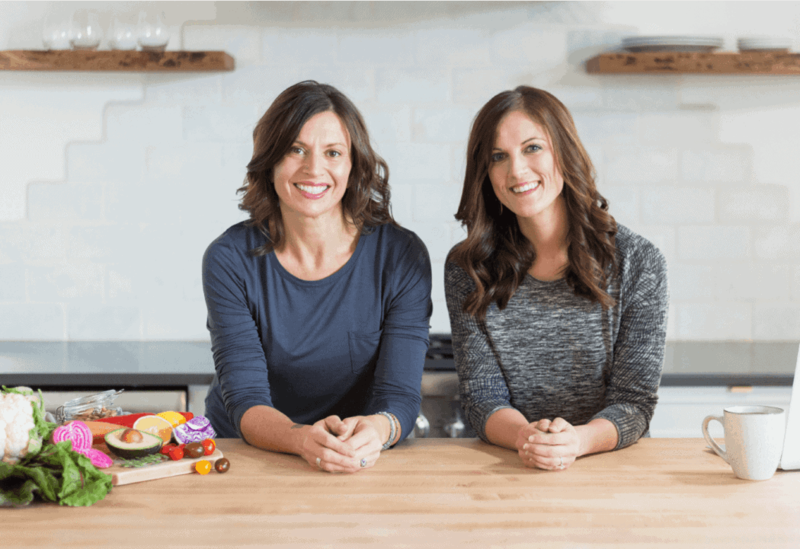 I am allergic to almond flour…..any substitute(s) you might suggest? 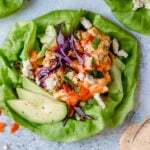 If you’re looking for a grain-free sub you could try cassava flour. Otherwise someone did inform us that they used only coconut flour and they turned out great. 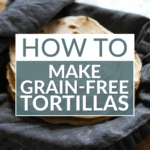 If you don’t need the flour to be grain-free, you could use oat flour or a gluten-free flour blend. Hope that helps! Hello! 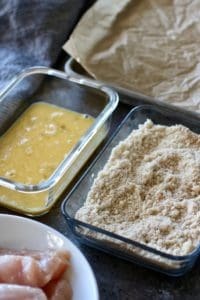 Do you think arrowroot flour can be substituted for the coconut or almond flour? Thank you! You can probably use arrowroot flour in place of the other flours (though we’ve not tested it that way so can’t say with 100% certainty). You may not get a coating that’s as crispy but it should work. Let us know if you try it as others may be wondering the same thing. Our home love your amazing recipes. 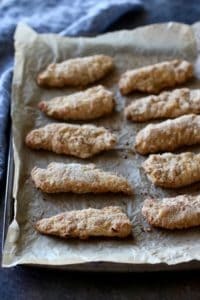 How can I make these strips without the almond flour?? My son has a nut allergy?? Hi there! 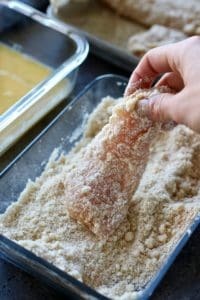 Someone else made this recipe with just using the coconut flour as they too had a nut allergy. 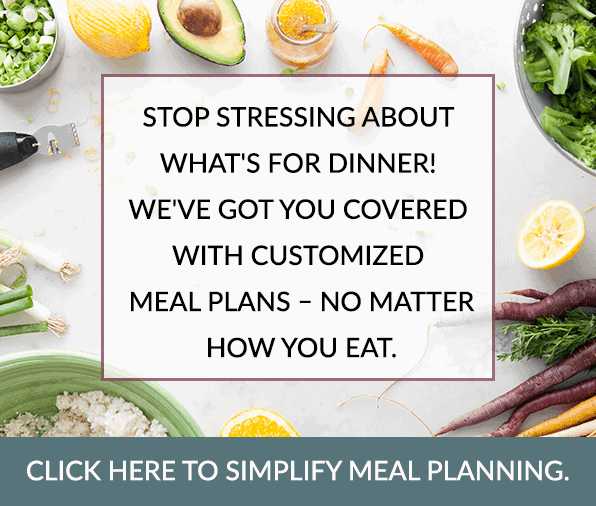 So you could try that or you could use substitute cassava flour. Hope you enjoy!